Business Writing Training Materials are designed for developing business-writing skills in the workplace. 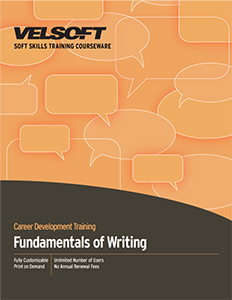 Confidently train employees and managers how to write concisely, how to use active and passive voice, sentence types, practical language and more! Seeing is Believing This sample manual to teach Business Writing is in MS Word format. For those who must write as part of their job, being able to write well is a real career boost. Learn how to capture participants thoughts on paper so they are strong and persuasive, but at the same time clear, concise, complete, and correct. We can think about writing either as a process or as a product, the finished piece of writing. If we can think of it as a process, then by changing the way we go about writing, we can change the finished product. While participants will still be aiming to turn out a good product, their sense of satisfaction will arise partly from a greater appreciation of the process by which they get there. This two-day workshop will concentrate on the nitty-gritty details that writers have to contend with, and give them some practical advice on making the job less difficult. They will also have opportunity to discuss their writing problems and share solutions with others in the workshop.